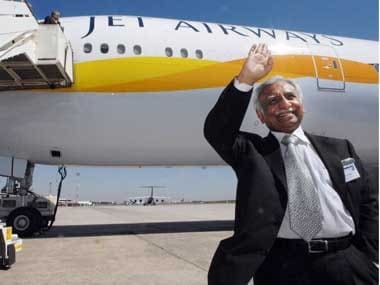 Jet Airways Ltd Chairman Naresh Goyal and his wife Anita stepped down from the board of the cash-strapped airline on Monday, media reports said. 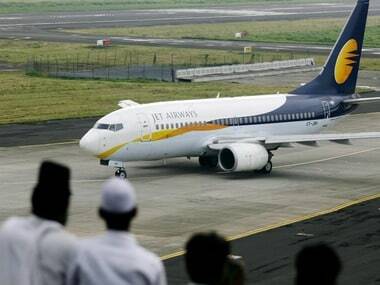 The board of Jet Airways met in Mumbai on Monday to decide on ways to procure interim funding, said an IANS report. Goyal would also cease to be the chairman, according to a regulatory filing. "Nearly all of us have financial responsibilities. We fear that a sudden collapse of the airline might be imminent. We need our dues to be paid by 31 March and a clear roadmap for our company," National Aviator's Guild Vice President Asim Valiani was quoted as saying by the news agency. Goyal has reportedly agreed to cut his stake in the airline to 9.9 percent from the earlier 51 percent, CNBC-TV18 said. The airline's chief executive Vinay Dube is expected to stay on board. In another #CNBCTV18Exclusive, sources have told @awnusharma that @jetairways' founding chairman Naresh Goyal has agreed to cut his stake in the airline to 9.9%. However, ET Now, citing unnamed sources, said Goyal’s stake will be cut to 25.5 percent from the current 51 percent, while Etihad Airways’ stake in the debt-laden carrier will also be halved to 12 percent to make room for the banks to take a controlling stake of 50.5 percent in the airline. Shares of Jet Airways jumped over 15 percent after media report claiming Goyal has agreed to reduce his stake. Shares were up 15 percent or Rs 34.15 to Rs 260. One nominee of Etihad will also step down from Jet Airways board, the airline said in a regulatory filing to the stock exchanges. Lenders will infuse up to Rs 1,500 crore in Jet airways via debt instruments, it added. Saddled with more than $1 billion in debt, Jet Airways is struggling to stay afloat. It has delayed payments to banks, suppliers, pilots and lessors—some of which have forced the airline to ground as many as 40 planes. "I think creditors and the debtor are in discussion. That is the best process," Srinivas said. "If there is a good outcome from the negotiations between the creditors and the corporate debtor, then that is better than dragging into insolvency... but if that (insolvency) is only option left at that stage, then bankers will take a call," he noted. The cash-strapped airline, which has been operating for over 25 years, is looking to restructure its debt, estimated to be more than Rs 8,000 crore, as well as raise fresh funds. 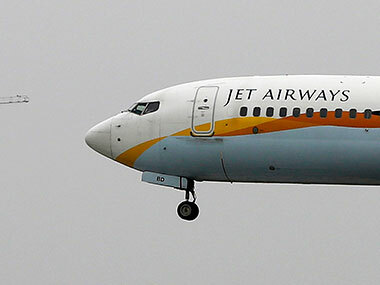 Lenders of the crisis-hit Jet Airways are likely to acquire a substantial stake in the carrier till a new promoter is roped in, sources said last week, a PTI report said. 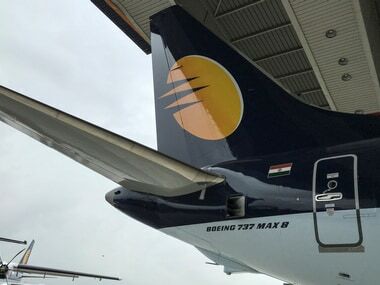 Earlier, Jet Airways reported a net loss of Rs 587.77 crore for the third quarter of the current financial year versus a net profit of Rs 165.25 crore a year earlier. And the key input cost -- aircraft fuel expenses jumped 29.8 percent y-o-y to Rs 2,387.7 crore in the December 2018 quarter, and the resulting weak financial performance of the company. The airlines had also highlighted its rather difficult financial position while declaring its December 2018 quarter results and it had pointed out the negative net worth of Rs 10,370 crore at the end of the third quarter of the current fiscal. A negative net worth of a company indicates a weak financial situation in which a company’s liabilities exceed its assets plus shareholders’ equity.